Who is a Tax Payer (Deductee)? Salaries: In case of salaries, the deductee is termed as an Employee. All the information of deductions and payments in this category should be submitted in Form 24Q to the government. Non-Salaries – Resident: In case of non-salaries and payment being made to a resident in India, the deductee is termed as a Deductee or a Party. All the information of deductions and payments in this category should be submitted in Form 26Q to the government. Non-Salaries – Non-Resident:In case of non-salaries and payment being made to a non-resident of India, the deductee is termed as a Deductee or a Party. All the information of deductions and payments in this category should be submitted in Form 27Q to the government. Can we verify TDS certificate (Form 16A) issued by the deductor from Form 26AS? How can a Tax Payer view Form 26AS? Tax Payer must register and login to TRACES to view Form 26AS for a Financial Year. When is Form 26AS generated? Form 26AS will be generated whenever a transaction related to point # 2 in this FAQ happens in relation to the tax payer. It will be updated further with all the transactions reported / processed for the given FY. What should I do if there is any error in the information displayed in Form 26AS? Can negative entries appear in Form 26AS? If there is any error in TDS / TCS return or in the challan detail uploaded by bank, for rectifying this, original credit entry will be reversed by debit entry in Form 26AS and a new credit entry will be posted (if required). Remarks column will be updated with the appropriate reason. I have paid Securities Transactions Tax and Banking Cash Transaction Tax, but it is not reflecting in my Form 26AS. What should be done? Tax deducted by an employer is not reflecting in Form 26AS. What could be the reason for this? Details of tax deducted will appear only after submission of TDS statement by the corresponding employer. In this case, employer should be approached to ensure filing of TDS statement with correct PAN. What should I do in case there are entries in my Form 26AS that do not pertain to me? If this is on account of ‘TDS / TCS’ credit, you may intimate your deductor / collector. If this is on account of advance tax / self-assessment tax, you may intimate your assessing officer. What is the source of information like my name and address mentioned on Form 26AS? I have received a demand notice for my Income Tax Return, whom should I contact in this regard? For demand related to your income tax return (ITR), kindly contact ITRCPC-Bangalore or your Jurisdictional AO. How can I know if my deductor has filed the quarterly statement reflecting details for my PAN? You can check on TRACES if deductor has filed quarterly statement and whether the statement contains details for your PAN. This functionality can be accessed by Tax Payer without logging in to TRACES. Click on ‘View TDS / TCS Credit’ link under Quick Links in Tax Payer tab in TRACES home page. Enter details as requested on the screen and proceed. ‘Remarks’ will specify if quarterly statement (for the inputs entered by you) has been filed by deductor. ‘Count of Records Present’ indicates number of records for your PAN in the statement. How can a NRI Tax Payer view Form 26AS? 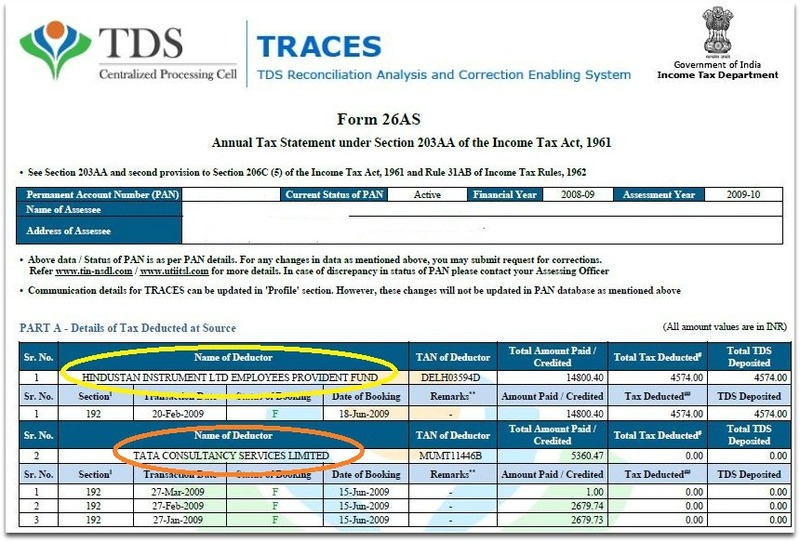 Tax Payer must register and login to TRACES link https://nriservices.tdscpc.gov.in/nriapp/login.xhtml to view Form 26AS for a Financial Year. How can Non Resident Indian (NRI) connect TRACES from outside India? NRI Tax payer has to register through the link https://nriservices.tdscpc.gov.in/nriapp/login.xhtml and login into TRACES. I am registered user on TRACES. Now I am out of India and trying to access TRACES but unable to connect it. What may be the reason? If you are trying to access the TRACES from outside India, please login through the link https://nriservices.tdscpc.gov.in/nriapp/login.xhtml . I am Non Resident Indian. How can I view my 26AS in India? What are the activities that a NRI Tax Payer can perform through TRACES (https://nriservices.tdscpc.gov.in/nriapp/login.xhtml)?